Commercial pear cultivation has changed substantially since the 1970s. In contrast to the large canopy, high-stemmed and labour-intensive trees that were dominant until then, commercial cultivation today uses only the low-stemmed form. Today, 10-20 times as many trees are grown in the same area. Their height is limited so that all work can be done by hand without a ladder. Today, only 10-20 varieties are of economic significance and there is less intense breeding of new varieties compared to apples. Pears are usually grown in concentrated cultivation in regions with well-drained, humus-rich soils. Areas where late frosts are rare are preferred. Sunny locations are ideal, but heat and, above all, dryness have a negative effect on fruit formation and quality. The plant form (high-, half- or low-stemmed) is determined by the rootstock. The high-stemmed fruit trees were replaced because of easier workability and earlier yields after establishment. Adequately supplying trees with calcium (Ca) is of highly important when producing pears that are to be stored. Although only about 3kg/ha of Ca is stored in the pulp, even minor Ca deficiencies lead to unstable cell walls and physiological disorders. Basal fertilization with P, K, Mg, Ca and B is best done during the dormancy period (November - April), on snow-free, not frozen or heavily soaked soil. Organic material is ideally applied at the beginning of the season (March - April). The quantities applied are based on the amount extracted. The table shows uptake and removal per tonne of pears. According to this, pear trees mainly need nitrogen, potash and calcium. For example, a pear yield of 50t/ha takes up 90kg N/ha. If 30kg N/ha are supplied by the soil, then another 60kg N/ha would need to be fertilized. 40kg N/ha would be removed from the field by the harvest. Granulated fertilizers are applied by fertilizer spreader. The great advantage of this application technique is its high level of performance per hectare and the fact that the technology is universally available. Best suited for N fertilization in liquid form. The liquid fertilizer is dissolved in the tank and can be applied in a targeted manner using a boom sprayer. The nutrients are more targeted to the trees through this application. Fertigation is the addition of fertilizer to irrigation water using suitable equipment. The advantage of fertigation is that the nutrients are applied continuously and in a targeted manner, reaching the vicinity of the root area. The increasingly widespread use of drip irrigation systems in orchards has also increased the importance of fertigation. Foliar applications of fertilizer are suitable when deficiencies need to be addressed swiftly. The roots cannot absorb all the required nutrients at the desired rate (under particular soil or weather conditions). When this happens, one or more applications of foliar fertilizers are beneficial. Nutrients that miss the leaf can also be taken up from the soil. Nitrogen fertilization takes place over two to three doses once the growth stage has begun, shortly before flowering until the end of June. The trees absorb the nitrogen mainly as nitrate. Nitrate (anion) can promote the uptake of cations such as calcium (Ca2+), magnesium (Mg2+) and potassium (K+). N-doses can be applied specifically to the tree rows and only occasionally in the tramlines. If the N fertilizer is targeted exclusively to the tree rows, the concentration rate (N per area) should not exceed twice the concentration which would otherwise be used across the entire area. The total amount can be concentrated on the rows if used together with P, K, and Mg. N can be fertilized in liquid form using a boom sprayer or via irrigation. 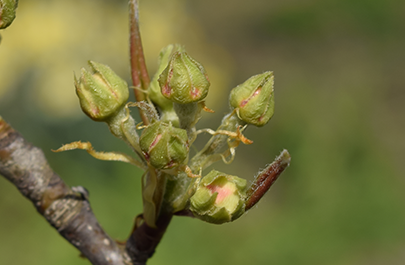 Young trees are fertilized according to their stage development. Calcium is provided as chloride, oxide or chelate to prevent physiological disorders such as bitter pit, flesh browning, soft pulp, etc. Often one to two treatments five and three weeks before harvest are sufficient. 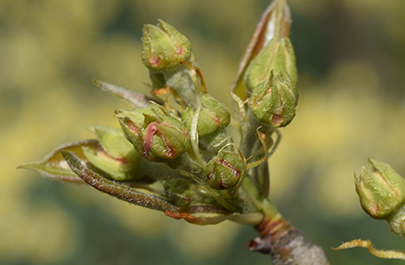 Susceptible varieties or trees with low fruit setting need four to six treatments, approximately every ten days. Calcium is important for cell wall strength and cell wall growth and thus for good storage quality and shelf life. Depending on growth and yield, annual MgO extraction is approximately 30kg /ha. Two-thirds of the nutrients taken up are found in the leaves, but these remain largely in the nutrient cycle. A good way to carry out magnesium soil fertilization is by using Mg-containing limestone. 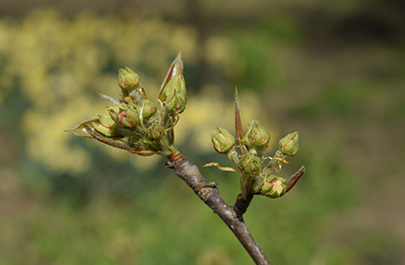 Pear trees are classed as being mildly sensitive to chloride; fertilization is best done using low-chloride or chloride-free potash-based NPK fertilizers.